This is probably one of the largest communities in La Quinta. Home to over 12,000 residents alone, La Quinta Cove is located toward the base of the mountains in the southwest quadrant of the city. This is primarily residential with both single family homes and attached properties built between 1936 and 2016. Sizes are wide from 600 square feet and 8400 square feet. Some homes even have up to 9 bedrooms! La Quinta Cove is accessible via Eisenhower Drive or Avenue 52 and is just minutes away from Old Town La Quinta, shops, restaurants and the Tower Village Market. The La Quinta Village shopping center is a few blocks away as is the public library and several schools. The majority of homes have no homeowner association fees, which is unusual for a La Quinta community, however, this is one of the largest in the area. Residents with school age children are typically served by the Benjamin Franklin Elementary school, the La Quinta middle school and the La Quinta high school, however, the John Adams elementary school is just a few blocks from the Franklin one and some residents are split between the two. The tradition golf club is located to the east of this community. This is also considered a little bit of a historic neighborhood at the base of the Santa Rosa mountains. Many homes offer impressive views of the surrounding landscape. Within La Quinta Cove, are several smaller communities such as the Yucatán Cove offering stunning views and higher-priced properties. Homes on the lots with mountain views are extremely rare and sell very quickly. Not only is this a great community for a variety of price ranges and home styles but for those that love nature, there's plenty of hiking and nature trails surrounding the community. 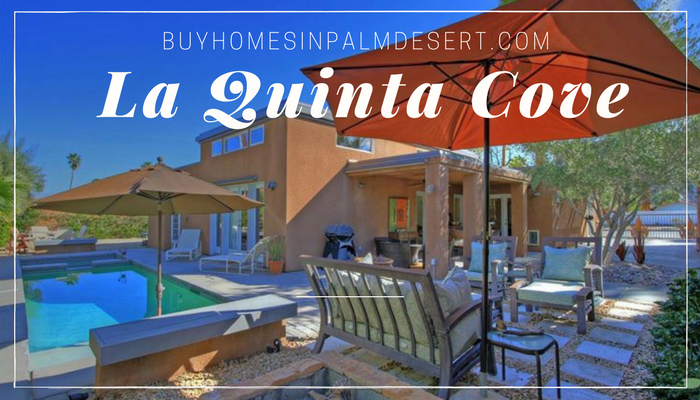 If La Quinta Cove sounds like your cup of tea browse all available listings here or contact my office to schedule a showing at any time.